In his stinging critique of hegemonic capitalistic practices, Magnuson proposes a commendable yet difficult journey toward personal enlightenment, a more humane economy and a better future. Magnuson presents an ethical critique of conventional economics based in Buddhist principles, offering a hopeful and creative path to system stability, personal satisfaction, and liberating transformation. His proposal for right livelihood banking challenges institutionalized greed and provides a karmically positive alternative motivated by social well-being. 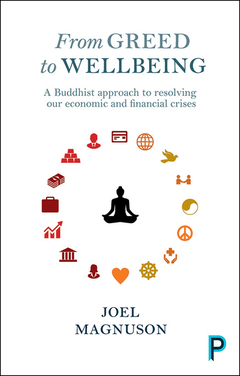 This is an insightful critique of our dysfunctional economic system, informed by Buddhist principles. Magnuson shows that the reforms usually proposed cannot alleviate the basic problem: a system that is self-destructive because it institutionalizes greed. And he offers a way forward implied by Buddhist teachings. Restructuring individual consciousness and restructuring society are complementary activities, and both are desperately needed. The new book of Joel Magnuson shows us the way how to do this. Joel Magnuson skillfully applies Buddhist teachings to quench the flames of greed, hatred, and delusion that are consuming our world.